"ALWAYS"…My New Novel in the US! I'm so excited to share the cover for my new novel. 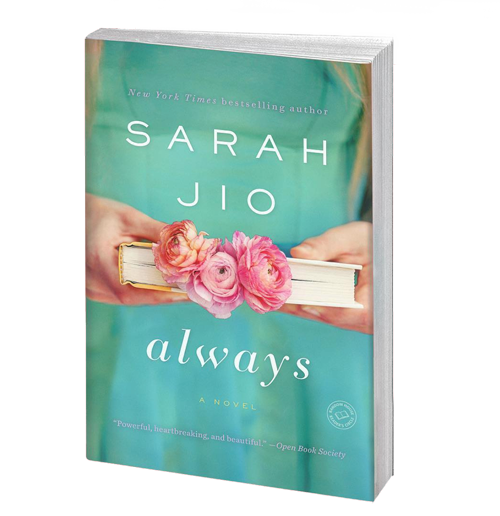 ALWAYS will be published in hardcover from Random House (Ballantine Books) on February 7, 2017. Isn't the cover gorgeous!? I can't wait for you all to read. If you'd like to preorder a copy, click here! My trip to Istanbul last November was one of the most memorable experiences of my life. I can't wait to return this year and say hi to all of my lovely Turkish readers again. Until then, back to work on my new novel! Book tour observation #258: A lot of time was spent on my hair. Thank you, Brandon for documenting the hours of prep work (hehe). The Cover of MORNING GLORY in Germany! Look at this beauty! I'm so excited to share the cover of the cover of the German edition of MORNING GLORY, to be published by Random House Germany soon! I've been quiet on this blog, but life has been so full. I've been documenting part of my journey for Glamour, working on some exciting new projects, traveling all over the place (from Moscow to Mexico, Big Sur to Napa, and a few other places in between). But through it all, I've been finishing my eight novel, which I'm incredibly excited about and proud of. I'm in the final mile. More soon. I'm so thrilled to announce that the Turkish edition of THE LOOK OF LOVE, called "AGAPI" debuted in Turkey this week. It was the #1 bestselling new book on the market this week and is climbing all of the bestseller charts. I've been busy doing a bunch of interviews for Turkish media and my lovely publisher, who I signed a new three-book deal with recently, is offering the chance for five readers in Turkey to win an evening out with me when I visit Istanbul this coming November. (Wow, right?!) I'm so grateful to my lovely Turkish readers and so excited for everyone to read this story!